The breast-feeding mafia is irritating. They exaggerate the benefits of breast-feeding and lay unnecessary guilt on mothers who can’t or won’t do it. That said, Jennifer Doverspike at the Federalist is completely wrong to be concerned that the promotion of breast-feeding in the U.S. represents a legitimate threat to our personal liberty. To Doverspike, the push for breast-feeding is just another attack on freedom. She complains about the surgeon general’s 2011 Call to Action, saying it “reflects the absurd lengths to which these activists will go to justify government involvement in infant feeding practices.” Her evidence that the jackboots are on the verge of kicking bottles out of parents’ hands? The creation of an interagency task force to promote breast-feeding and the suggestion that civil servants get paid maternity leave. It takes a lot of time in the libertarian bubble to start arguing that the right to take some time off work amounts to a substantial loss of freedom. Doverspike also objects to New York City’s program to encourage breast-feeding at hospitals, which she characterizes as treating formula like it “must be guarded and distributed with roughly the same precautions as addictive and harmful narcotics.” The problem is that a sober-minded assessment shows that no such thing is happening. The program basically bans aggressive formula advertising and pushes nurses to have a talk about the benefits of breast-feeding before they give new mothers formula. Yes, the formula is in a locked cabinet, but so are all hospital supplies, last time I checked. While the benefits of breast-feeding are exaggerated, that doesn’t excuse Doverspike for ignoring the one major upside that has been repeatedly demonstrated: Breast-feeding, particularly in the first few weeks, improves immunity in babies. Jennifer, look at this from a cost-cutting perspective. Sick babies are expensive. Pushing nurses to take a few minutes to talk over breast-feeding with new mothers who may not be fully educated about it could go a long way to preventing illness and lowering health care costs. Unable to make a substantive case that the U.S. is letting breast-milk mania destroy our freedoms, Doverspike turns her ire on the World Health Organization. The WHO laid out standard regulations in 1981 preventing formula companies from aggressively advertising, regulations that have been adopted by 84 countries. It’s worth noting that this in no way restricts parents’ rights to choose formula, though it is a restriction on a corporation’s right to advertise. 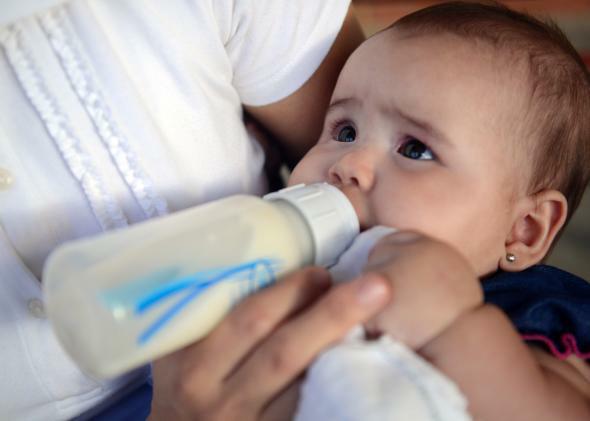 In addition, some countries put more controls on formula to make it harder to get. What Doverspike fails to mention is why the WHO wrote out these regulations in the first place, something a quick Google search reveals. As reported at the time by the New York Times, researchers had discovered that poor parents were stretching out formula by watering it down, which was leading to malnutrition in infants. In addition, places that lack clean drinking water are places where formula feeding is downright dangerous. There are substantial benefits, particularly worldwide, to creating a culture where breast-feeding is the go-to way to feed children, and formula is only viewed as a supplement for cases where breast-feeding isn’t working. Of course, that does cut into formula company profits, so if that’s your priority, by all means, bash the WHO’s efforts to keep babies healthy some more.